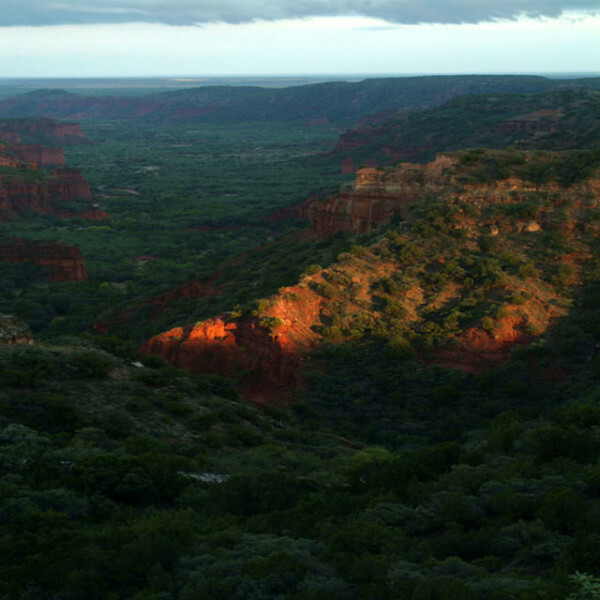 For millions of years the forces of wind, water and temperature have sculpted the canyons of the Llano Estacado. 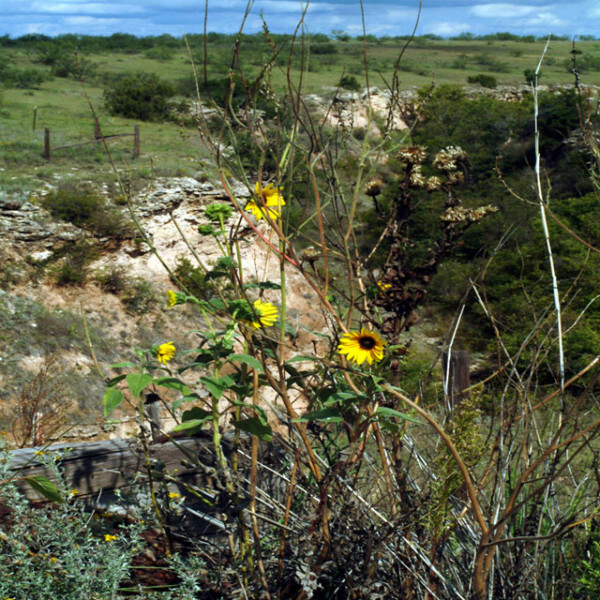 The escarpment of the canyons forms a transition between the flat High Plains of the Llano Estacado and the Rolling Plains toward the east. 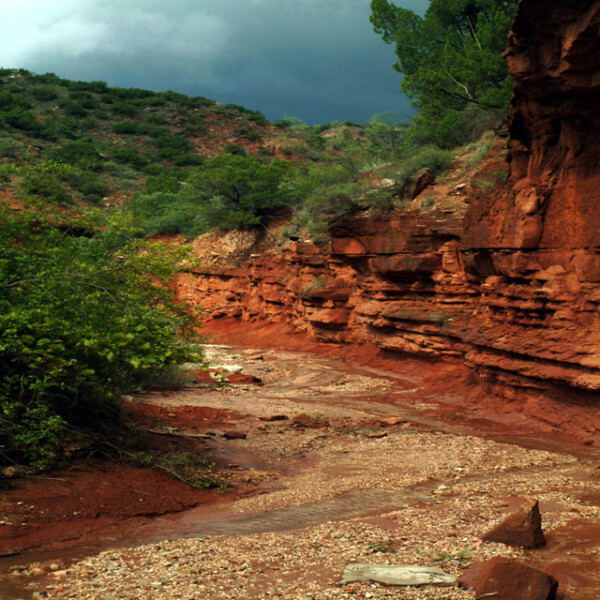 Eastern flowing streams from the Llano Estacado have cut through the Caprock Escarpment flowing into the Red, Brazos and Colorado rivers. 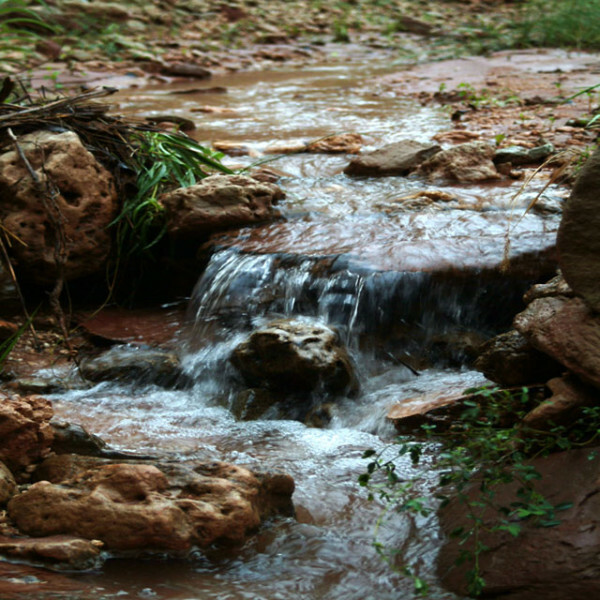 These streams have exposed layers of geology down to the Permian Quartermaster Formation of approximately 250-280 million years before present. 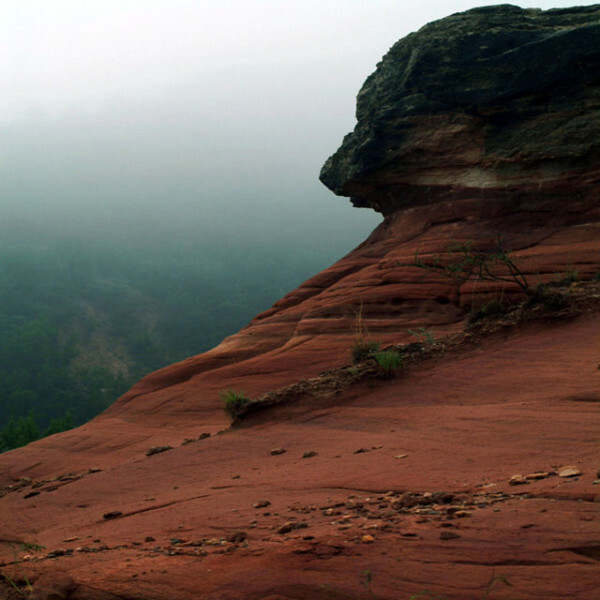 The "red beds" of the Quartermaster Formation are composed of red shale, sandstone, siltstone, and mudstone, and provide the region with much of its beauty. Geology greatly affects living organisms. Most sites above the escarpment are on the High Plains composing a short-grass prairie of blue grama, sideoats grama and buffalo grass. Because of its deep and fertile soils, the short-grass prairie has largely been converted to agriculture. 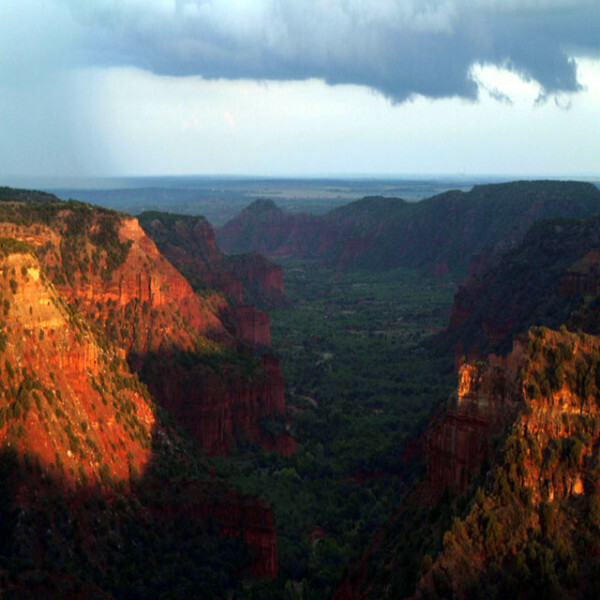 The canyons support several species of juniper, scrub oak, and many other types of trees and shrubs. Along the canyon bottoms are streambeds of tall and mid-level grasses. 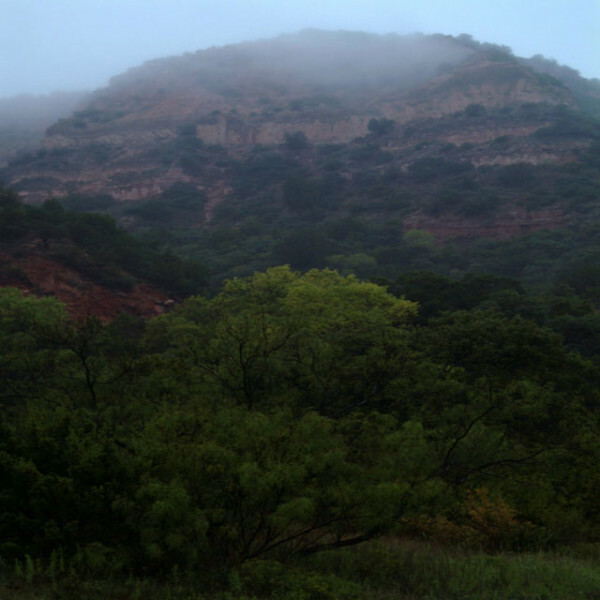 On September 12th and 13th, 2008 a few members of the Permian Basin Outing Club (PBOC) and I braved the elements of a rainy week and were greatly rewarded with grand vistas of Haynes Canyon and Caprock Canyons State Park and Trailway. We mountain biked a portion of the trailway from South Plains to Monk's Crossing–a distance of about 23 miles. 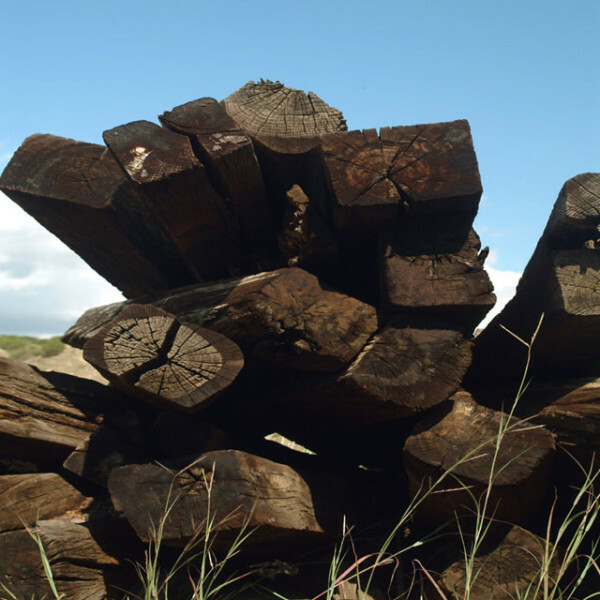 Texas Parks and Wildlife Department acquired the donation of 64.25 miles of a 1920s era railroad right of way stretching from South Plains to Estelline, Texas. The Llano Estacado is a short-grass prairie that has largely been converted to agriculture. 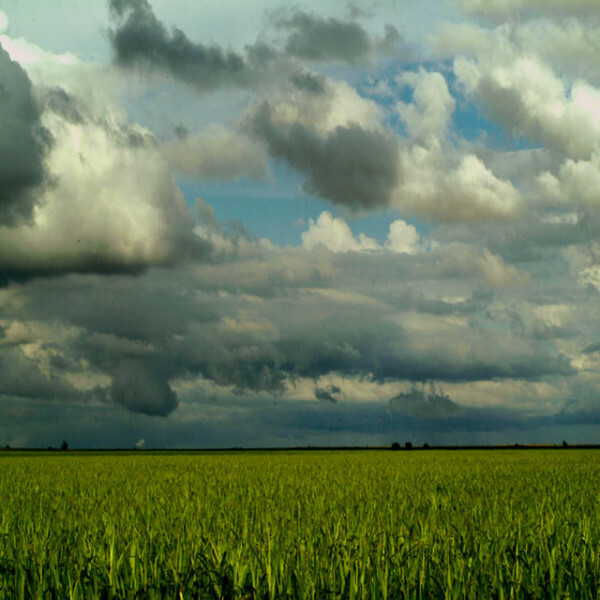 Wheat, cotton, sorghum, and corn are important crops. The seemingly endless flatness of the Llano suddenly gives way when the edge of the Caprock Escarpment is encountered. 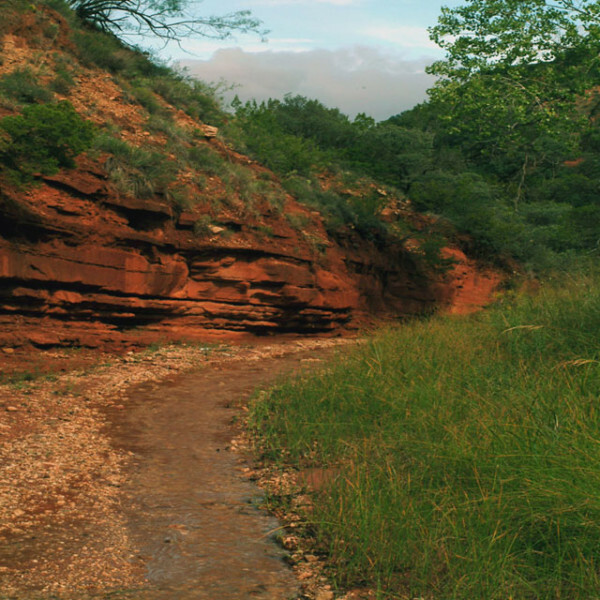 Haynes Canyon is a deep canyon on private land but is located near Caprock Canyons State Park. Streams cutting through the Llano Estacado eventually feed the Red, Brazos and Colorado rivers. 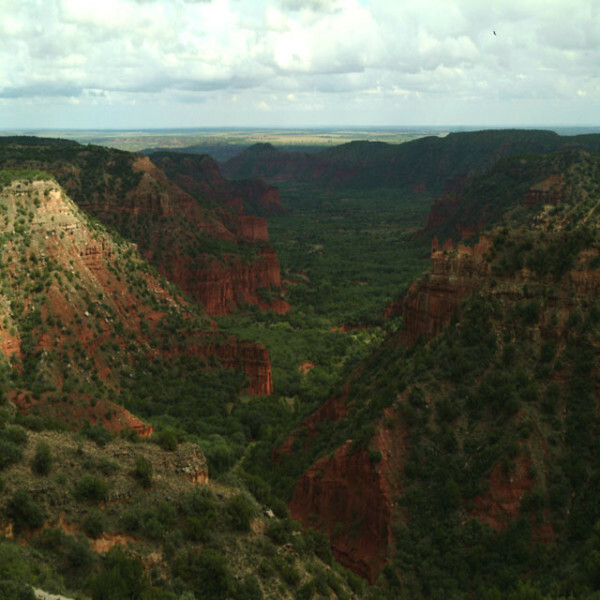 The Permian Quartermaster Formation is at the bottom of the canyons and dates to 250-280 million years before the present. 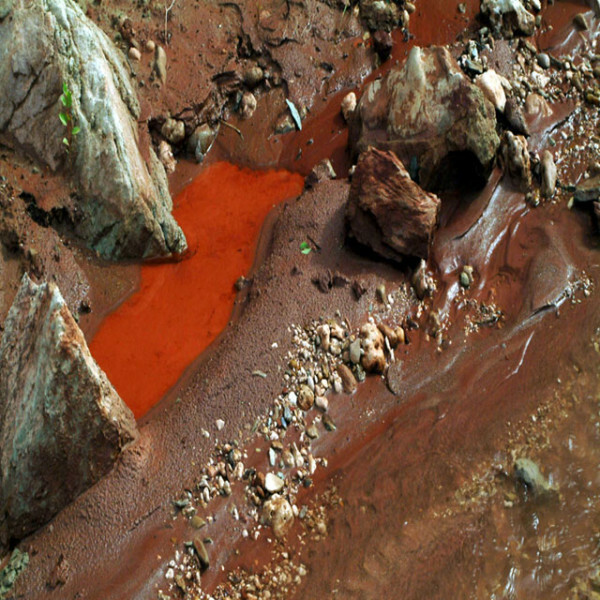 The red beds are composed of shale, sandstone, siltstone, and mudstone. Late summer foliage colors strongly contrast with the red beds. 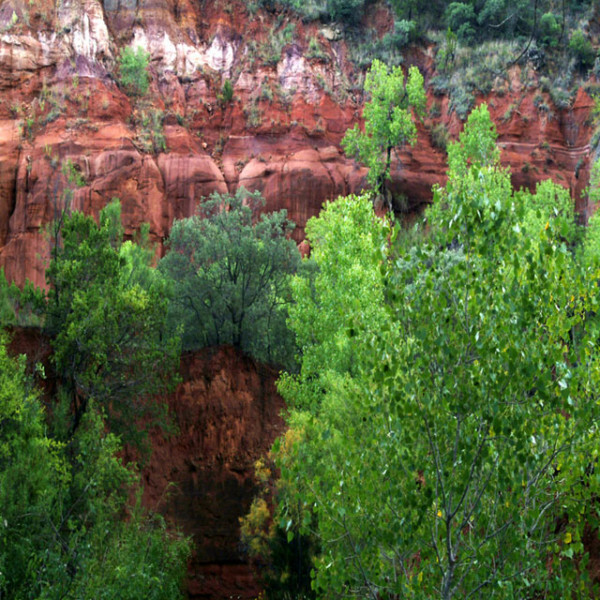 Cottonwood trees grow near water sources in the canyon bottoms. Cottonwoods grow up to 100 feet high and 8 feet in diameter. Their root systems are spreading and shallow. 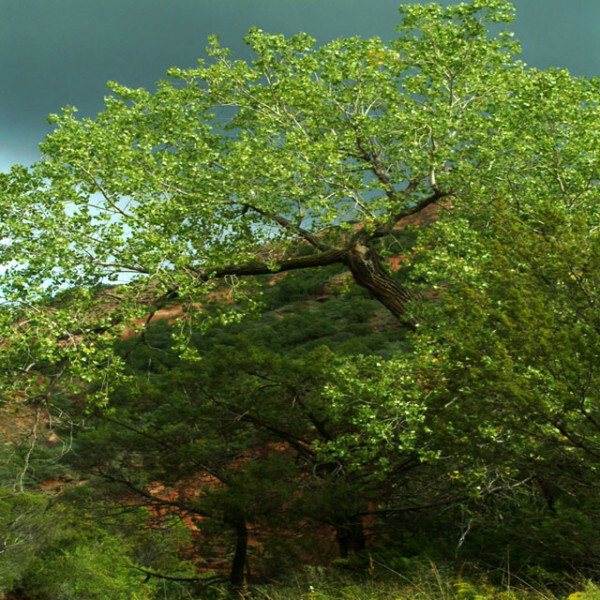 Alamo is the Spanish name for the cottonwood tree. 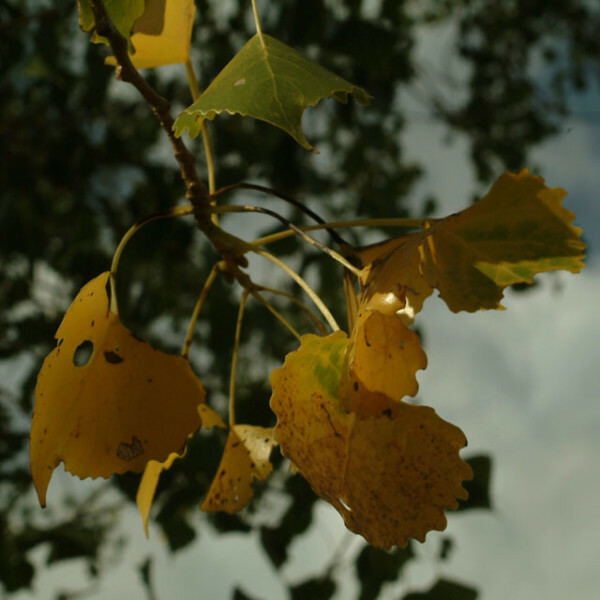 A hint of autumn can be seen in these cottonwood leaves. The rich colors of the Quartermaster red beds are striking in the right light. Maximilian sunflowers were in the bottom of Haynes Canyon. This species of sunflower was named in honor of Emperor Maximilian of Mexico. Birds find it to be an excellent source of seed. Light and shadow mingle at sunset on the rim of Haynes Canyon. 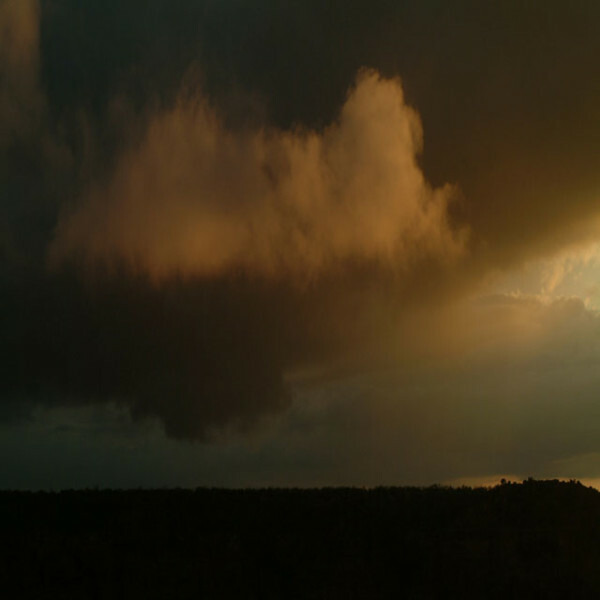 Storm clouds add to the drama of sunset at Haynes Canyon. 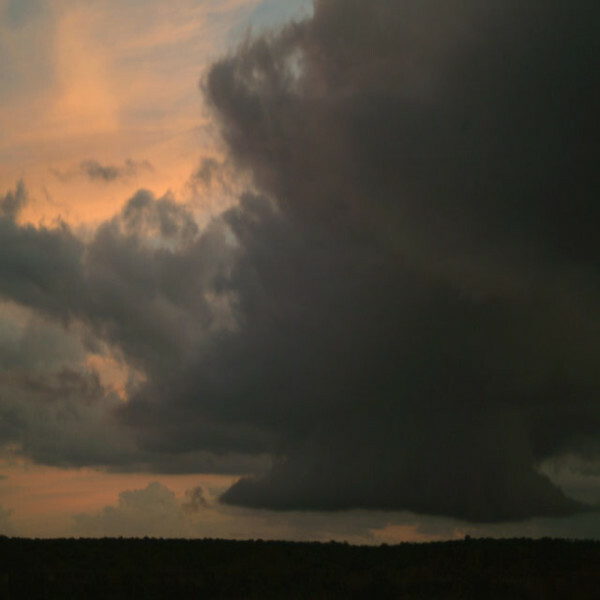 Cumulonimbus clouds were spawned as a result of a tropical system that dumped heavy amounts of rain in the Panhandle and South Plains. It was strange that there were storm clouds all around, but blue sky directly above. 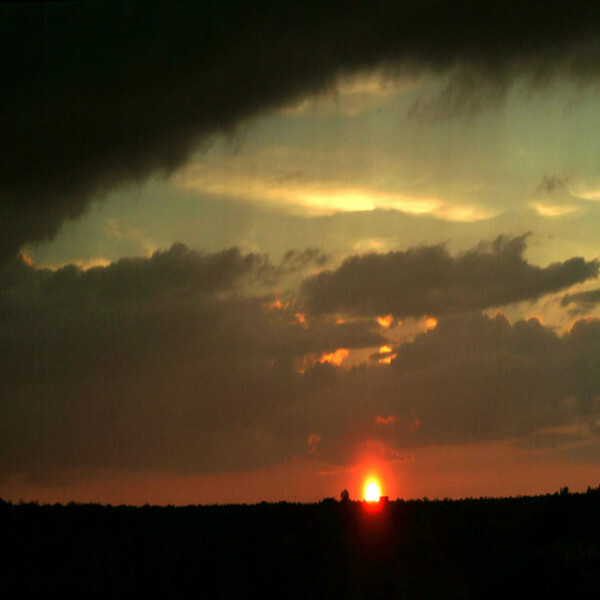 Photo opportunities abounded until the last rays of the sun set in the west. The next morning we were awakened by the sound of a landslide in Haynes Canyon. The canyon floor was eerily enshrouded in mist---very much like a tropical cloud forest. Rain-fed tributaries eventually feed into the Little Red River. 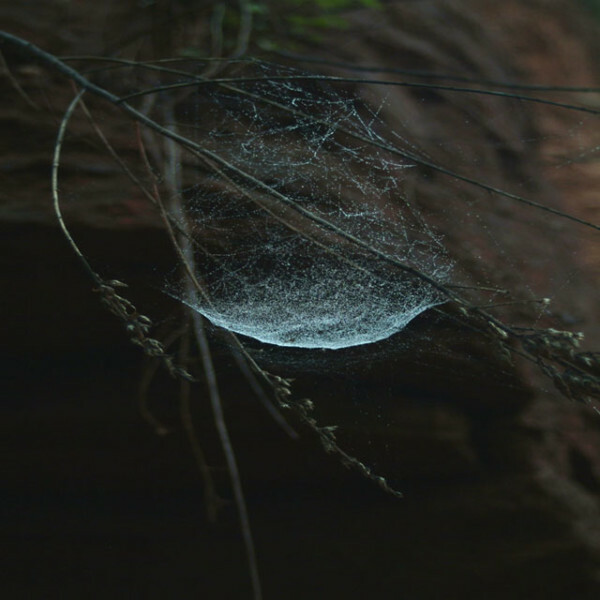 There were several dew-covered, basket-shaped spider webs constructed in the grass and other plants close to the ground. Thickets of poison ivy were not uncommon. 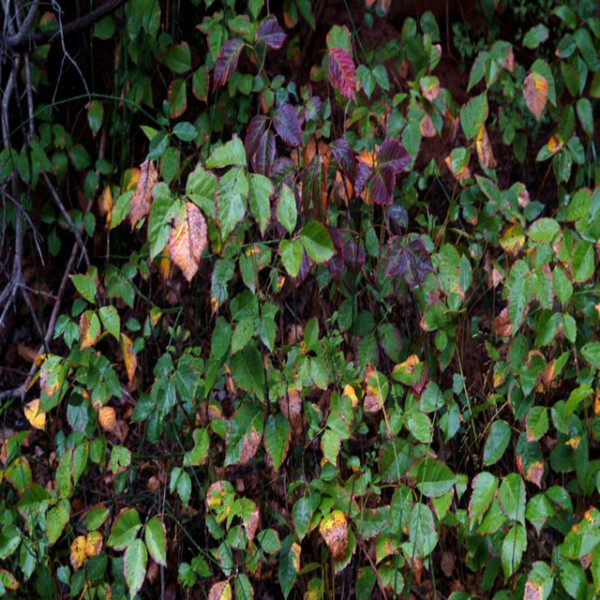 Poison ivy is highly variable in its growth habit, sometimes being a shrub, and sometimes a woody vine. The trifoliate leaves also vary greatly in size and shape. Upon contact with the skin, poison ivy produces oil that raises itchy, burning blisters in some people. 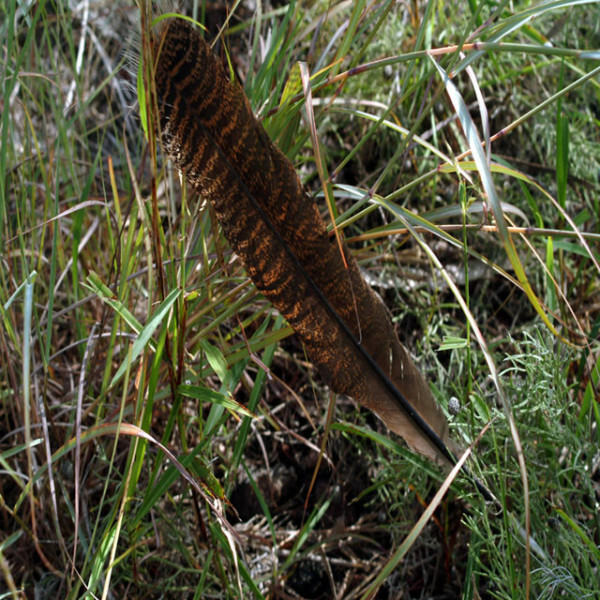 Its fruit is known to be eaten by at least 75 species of birds, particularly wild turkey and bobwhite quail. 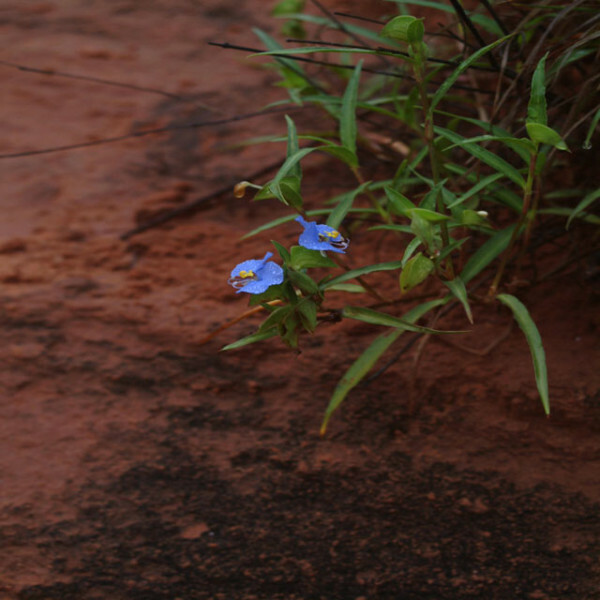 Dayflower, or widow's tears, has two rounded, bright blue upper petals; a third lower petal is small, pale, and inconspicuous. This member of the spiderwort family blooms for a day, but there are several buds on a plant emerging from "boat-shaped" bracts that open 3-4 days apart. 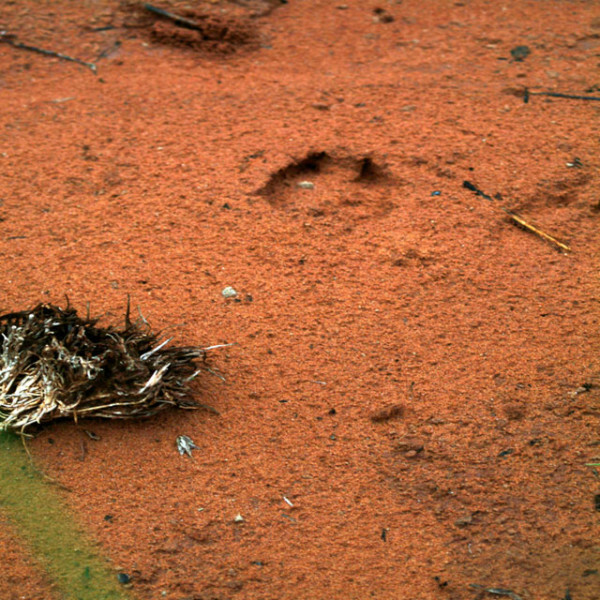 A deer passed this way the previous night. 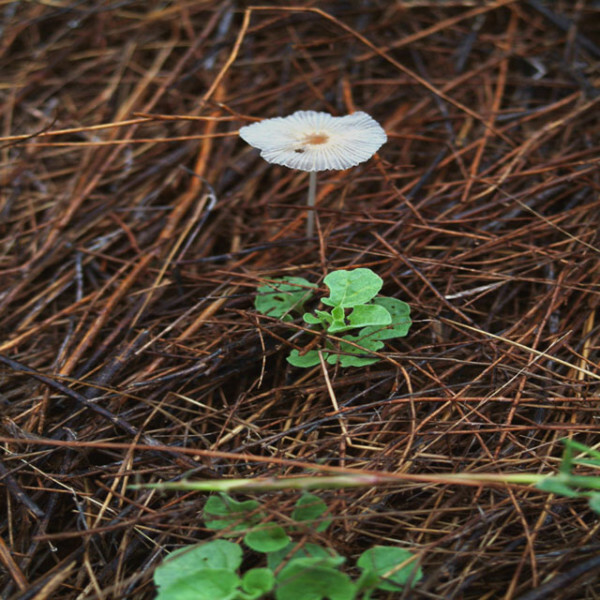 The umbrella inky cap mushroom grows solitary in grassy places. A mushroom is only the fruiting body of a larger, subterranean fungal network of fibers known as a mycelium. Inky caps are fragile mushrooms with dark spores that are disseminated by deliquescence (dissolving) of the cap in an inky liquid. Haynes Canton has some interesting sandstone "hoodoos." Plants grow wherever they can gain a foothold. 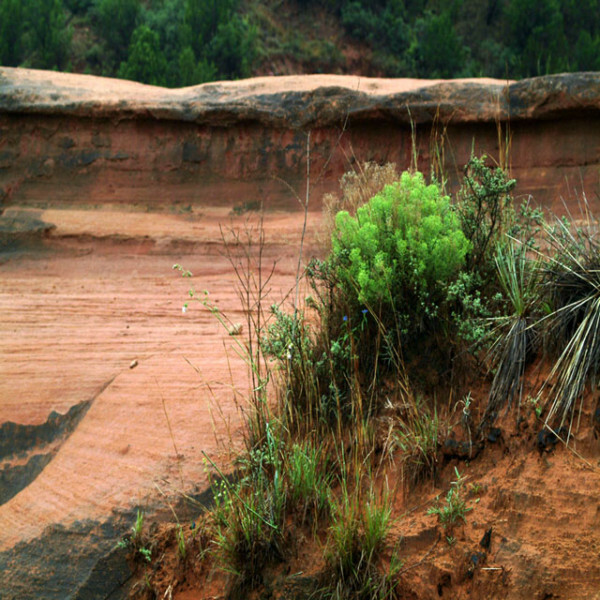 Root systems help to hold fragile soils together to reduce erosion. The colors of this Siberian elm come from yellow carotenoid pigments. A fungus is responsible for the dark blotches. Is that a profile of a wild turkey in this leaf? 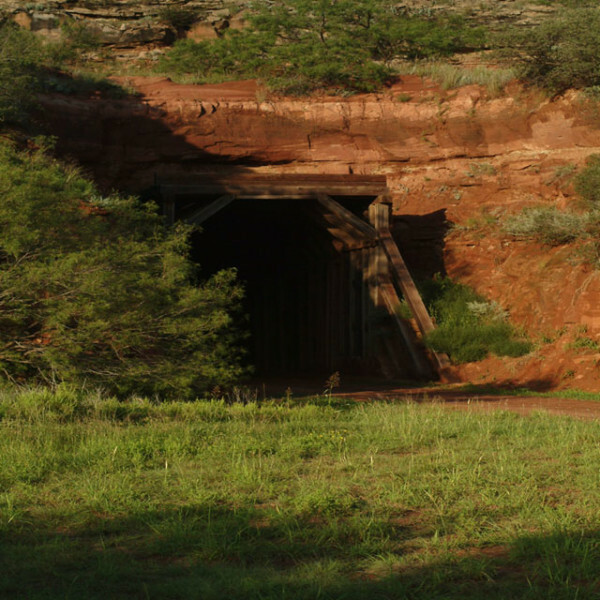 The Caprock Canyons Trailway System started in South Plains, Texas. 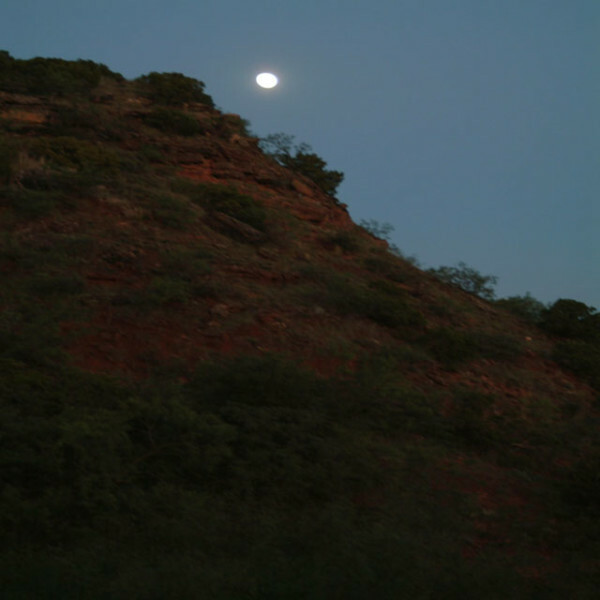 It wasn't long before the flat terrain yielded to the beginnings of a shallow canyon. 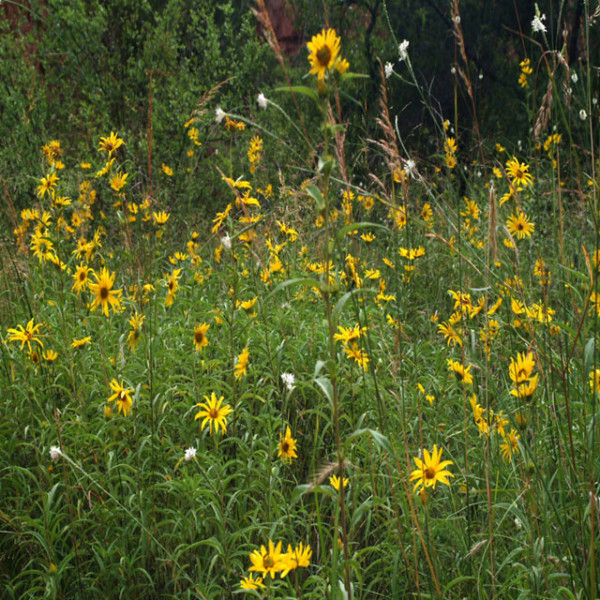 Plains sunflowers grow well in open prairies and sandy soils. 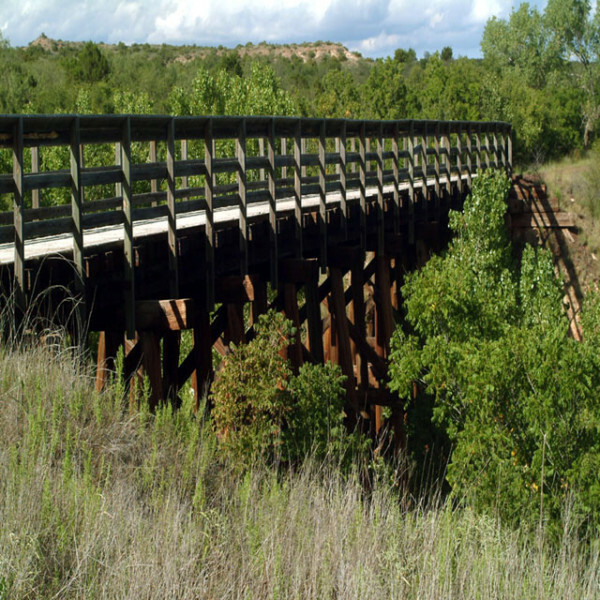 Several old railroad bridges are crossed in the trailway, the longest spanning more than 200 feet over Los Lingos Creek. In several places along the trailway one can encounter piles of formerly used railroad cross ties. 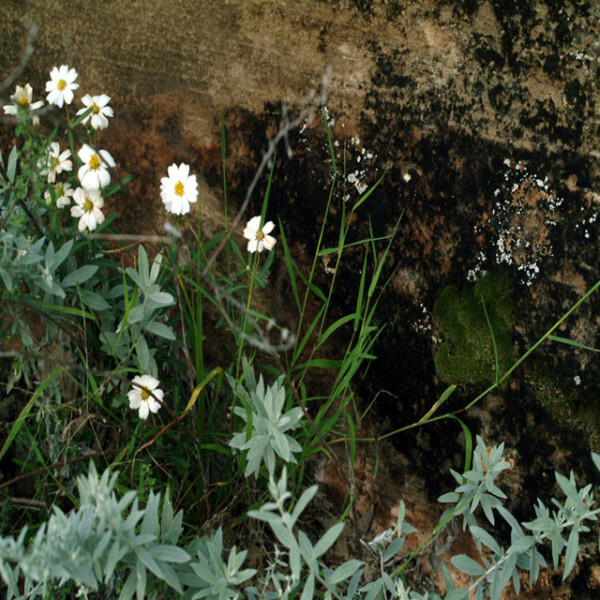 Blackfoot daisy is a very drought-resistant plant. It prefers dry, rocky places, often sprouting in cracks between rocks on slopes and ledges. 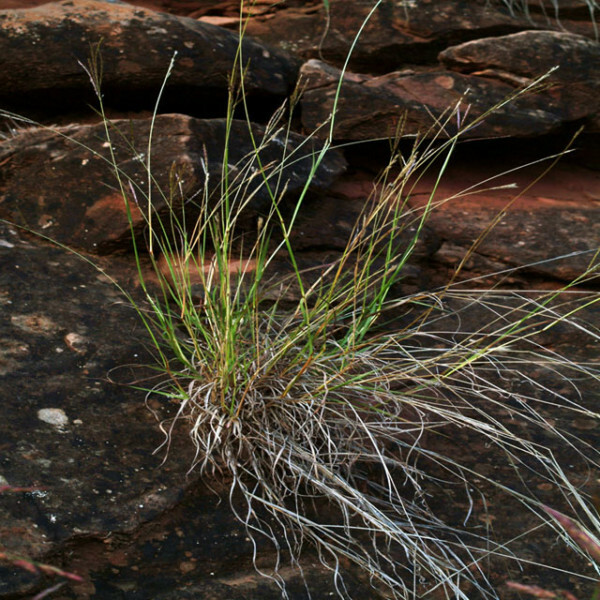 Without the flowering heads, it is difficult to determine this species of grass growing out of a rocky crevice. 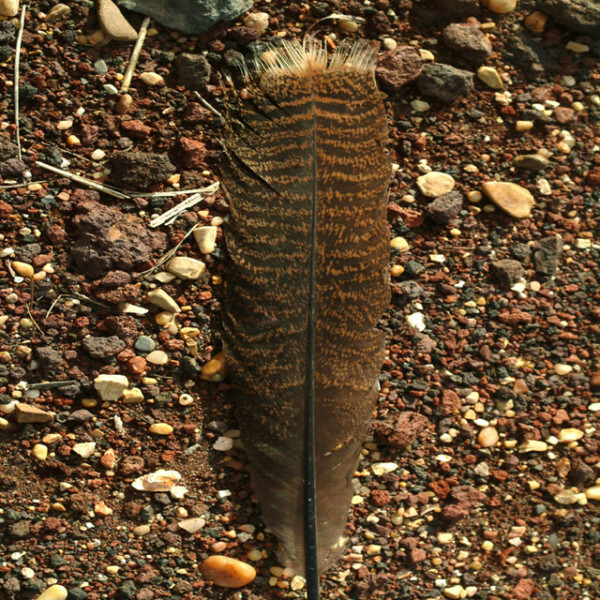 At one stop along the trailway there were several feathers of a wild turkey scattered about. The turkey is America's largest game bird. Did this turkey become the meal of a predator, or was it a near miss? 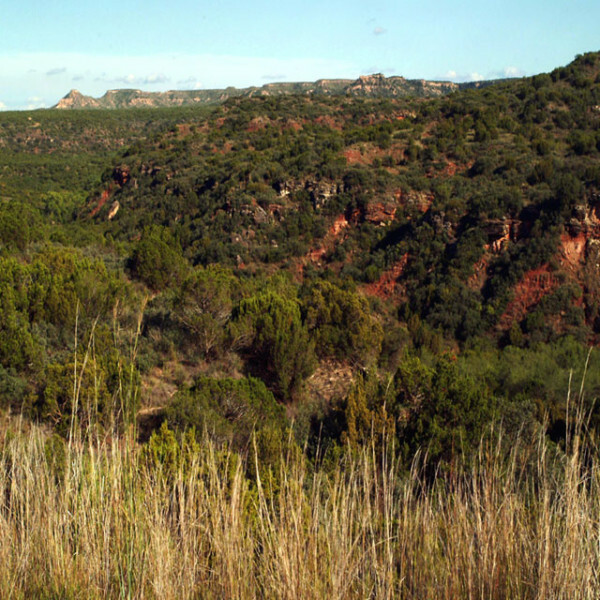 Caprock Canyon is not as deep or as narrow as Haynes Canyon, but the vistas are still spectacular! 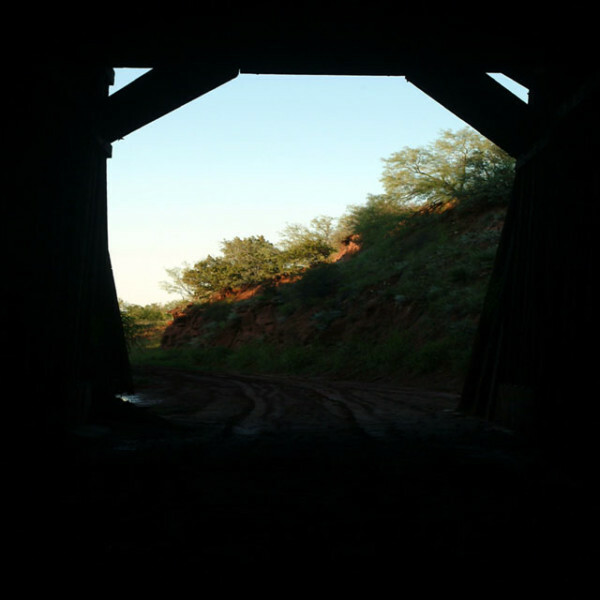 The highlight of the trailway is the 742-foot-long Clarity Tunnel, one of the last active railroad tunnels in Texas; now Clarity Tunnel is the summer home for thousands of Brazilian free-tailed bats. 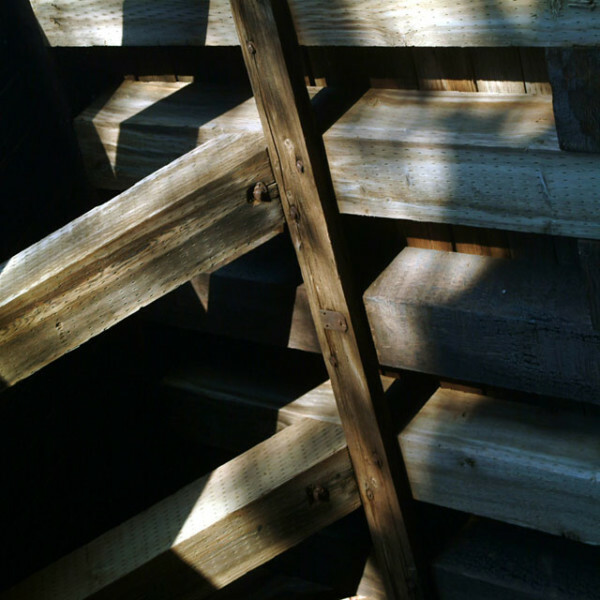 The light and shadows on the architecture of Clarity Tunnel make an interesting abstract composition. Upon entering Clarity Tunnel the pungent aroma of bat guano is most noticeable. At dusk it is time for the bats to take flight. 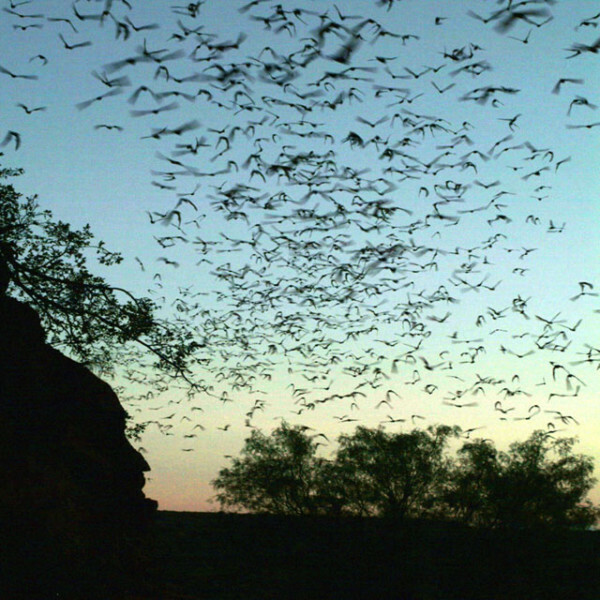 Honing in on natural cues, thousands of Brazilian free-tailed bats take flight. Standing at the tunnel's entrance, one can feel the breeze generated by a frenzy of flapping wings. The Brazilian free-tailed bat is primarily a colonial cave bat, but it also roosts in rock fissures, in buildings, and under bridges. The colonies are nurseries where the females congregate to bear and raise their young. 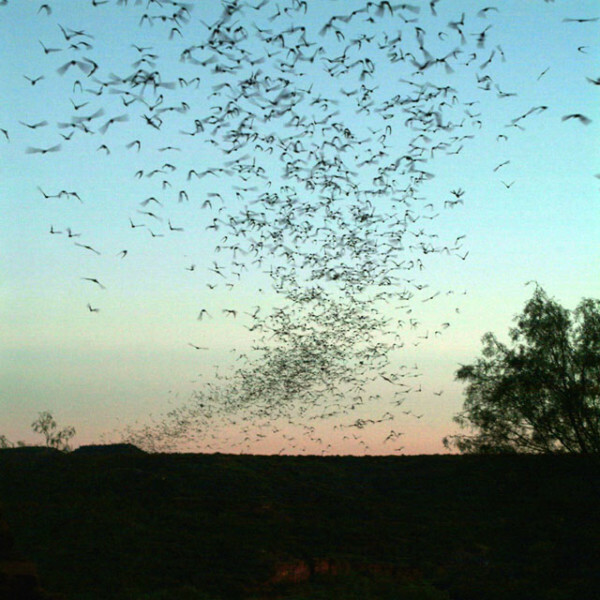 Even in the confusion of large swarms of bats females are able to recognize their own young. Males congregate singly or in small groups at other roosts. Summer bat colonies have a huge impact on regional insect populations; it is estimated that they devour 6,000-18,000 metric tons of insects every year in Texas (Davis and Schmidly, The Mammals of Texas, 1994). The trip concluded with a six-mile moonlit night ride from Clarity Tunnel to Monk's Crossing. It is interesting the different perspective that is gained during night time activity as might be experienced by a nocturnal animal.